Rincon, Puerto Rico has been one of the Conscious Connection team`s favorite Caribbean getaways for years. We recently revisited the popular surfing destination, lured back by the tropical beaches, the vivid ocean hues, and the incomparable island experience offered by Fish Eye View. 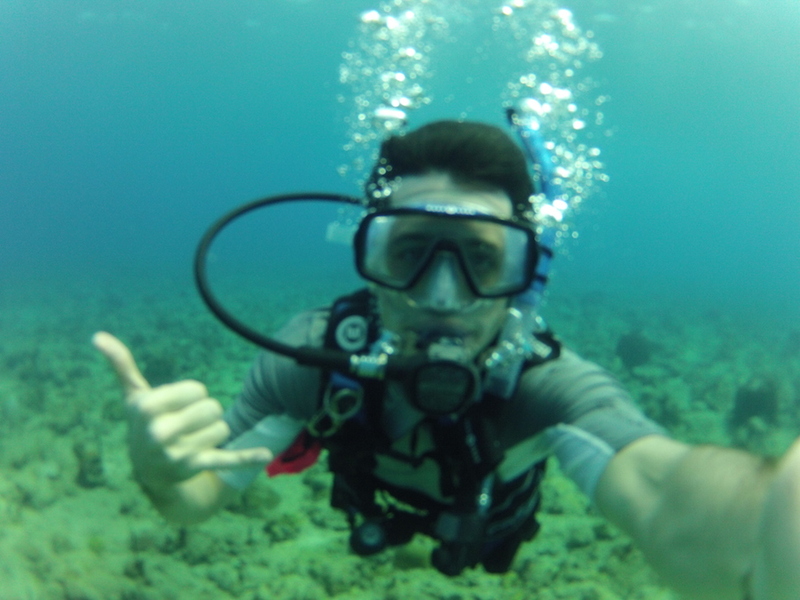 But this time around, we were looking to explore Rincon`s underwater attractions as we pursued our SCUBA certification from Aquatica Dive & Surf. Once we arrived at the Aguadilla airport, we rented a car – a staple for touring the island – and drove the 30 minutes to Rincon. While Rincon – “the corner” – is a small town, it provides premiere surfing, dining, and adventure opportunities. Our first stop was a quaint Airbnb studio apartment located in Barrios Puntas. Equipped with all the essentials and a unique rustic charm, this spot was a perfect retreat after the journey. The next morning consisted of a breakfast of huevos con carne and fresh pastries at Puntas Bakery, then it was off to the beaches for a day of Rincon’s renowned surfing. On our second night in Rincon, we returned to our usual home base, the Fish Eye View. This vacation rental is by far our favorite place to stay. The beautiful beaches alone are worth the trip, but Fish Eye View also acted as the perfect home away from home as we ventured out to enjoy all of the scenery and adventure Rincon has to offer. Fish Eye View’s expansive property resides on a hill that overlooks the five best surf breaks in Puerto Rico. It consists of a main house, three smaller apartments, and two infinity pools. Each accommodation offers sweeping ocean views and private balconies. The main house comfortably holds 8 people and consists of four bedrooms, 3 ½ bathrooms, a full kitchen, living room, TV room, and an outdoor dining area. Guests inevitably find themselves spending most of their time on the balcony, as the panoramic sunset views are breathtaking. We stayed in Fish Eye’s two-bedroom apartment, which was once the home of owners Craig and Michelle Prothers. Bay windows opened from the master bedroom to stunning views of Rincon’s prime surf spots, while French doors led to a private balcony equipped with a hammock and dining set and, of course, the ocean view. Once comfortably settled into our Fish Eye haven, we embarked on our SCUBA diving education. There’s nothing quite like breathing underwater for the first time. Our first foray into SCUBA diving began at Crash Boat Beach with the experts at Aquatica Dive & Surf. During our PADI Open Water certification, professional SCUBA instructors guided us in some of the best diving spots in western Puerto Rico. Crash Boat Beach is ideal for the inexperienced diver, but it also provides opportunities for seasoned divers to refresh their talents. The gently sloping ocean floor and calm conditions create an environment that allowed us to develop foundational safety skills. Once we were ready, the instructor led us along the pier to the ‘dolphin platforms,’ a set of platforms standing in 30 feet of water. The pillars supporting these platforms were covered in vibrantly colored corals; we watched as they attracted schools of sergeant major fish and other tropical species native to the region. We put our newly acquired certification to the test during a more challenging guided dive. Natural Beach, with its beach-entry dive and healthy reef, is great for more advanced divers. Conditions are generally calm, with more than 40 feet of underwater visibility year round. But because Natural is less sheltered than Crash Boat, surges and currents can be stronger. The dive site extends directly outward from shore. Once in the water, we followed the ocean floor as it sloped for 200 yards to meet the reef under 40 feet of water. Divers can venture along the sloping reef to depths of 70 feet, though frequently need to return to shore after 50-60 feet depending on air consumption or a diver’s decompression limits. Because this site extends deeper than 60 feet, Natural Beach can be used towards the Advanced Open Water certification. It’s a great site for certified divers looking for a guided dive. Lucky divers might catch a glimpse of a sea turtle or a spotted eagle ray, or even an eel or dolphin. Despite the days being quickly filled with diving, surfing, and sunning, there was still more to experience in Rincon. We snorkeled at Steps Beach, exploring an expansive coral reef amidst sea turtles and brightly colored fish. We spent an afternoon walking along Sandy Beach, combing for sea glass. One Thursday sunset, we happened upon a weekly-held local arts festival. We browsed an array of artisan goods, from paintings to jewelry to barriguitas de vieja (pumpkin fritters). And when we sought to explore the island beyond Rincon, we cliff-dove from the tops of the San Sebastian Waterfalls, a striking and secluded escape. Rincon also offers a wide range of dining experiences. At Copa Llena, a quaint restaurant in the midst of many local favorites, we sat on a deck built directly on the beach and listened to ocean waves as we dined on freshly-caught fish served in intriguing flavor combinations. At The English Rose, a hidden gem located on a mountaintop, we had a traditional English breakfast accented by the smell of tropical wildflowers and the coastal view. Or, if you’re looking for food on the go, try the fish tacos and lemonade at the pop up shop, Jack’s Shack. Another favorite of ours was Carte Buena serving fresh pressed juices, coffee and gluten free pumpkin muffins. There’s truly something for everybody in Rincon, Puerto Rico. Whether you’re looking for tropical relaxation or an island adventure, be sure to make the Fish Eye View your haven. And Rincon is certainly not limited by dry land. Take your getaway underwater and enjoy the scenery under the surface with the experts at Aquatica Dive & Surf.